A set of historic interviews with participants in UC Berkeley’s Free Speech Movement (FSM) has been released by the Regional Oral History Project, the San Jose Mercury News reports. The student-led movement -- which just celebrated its 50th anniversary, including a rally on Sproul plaza and a poster contest -- engaged in civil disobedience to force UC administrators to lift their ban of on-campus political activities and acknowledge students' right to free speech and academic freedom. 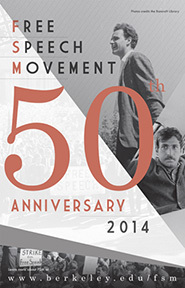 Learn more about the FSM’s history at the Free Speech Movement Archives or UC’s Calisphere. More fallout on UC's recent decision to increase salaries to chancellors making over $300,000. In an opinion in the Merced Sun-Star, two lecturers in UC Merced’s Merritt Writing Program say the disparity between chancellors and other staff “who are also working very hard is unjustifiable," and suggest that those executives "be the first to show America that pay equality in today’s world is possible." Editors at U-T San Diego, noting that UC offers "no convincing evidence" for raising chancellors' salaries, argue that UC leaders are oblivious to the "pay-tuition link." CalPERS, the largest public pension fund in the country, announced last week that it was ending its investments in hedge funds. As Al Jazeera noted in its story, the cost of fees to brokers could amount to as much as $600 million -- a strong motivation to dump the funds. Hedge fund investment returns have also lagged in recent years. UC is launching a $250 million venture capital fund to finance startup companies that result from faculty and student research. “Academic research is becoming increasingly entrepreneurial,” according to the report in the Wall Street Journal. The university is converting single-stall restrooms to be gender-neutral at its ten campuses, according to an announcement last week by UC president Janet Napolitano. The action follows the recommendation of a systemwide 15-member LGBT advisory established by Napolitano in June. UC appears to be the first university system to install gender-neutral restrooms at all its campuses. UC Davis will build a solar electric generation facility that is expected to provide almost 15% of the campus’s power. The 16-megawatt array will be built on a 70-acre plot south of the campus owned by SunPower, which will also design, maintain and operate the facility.